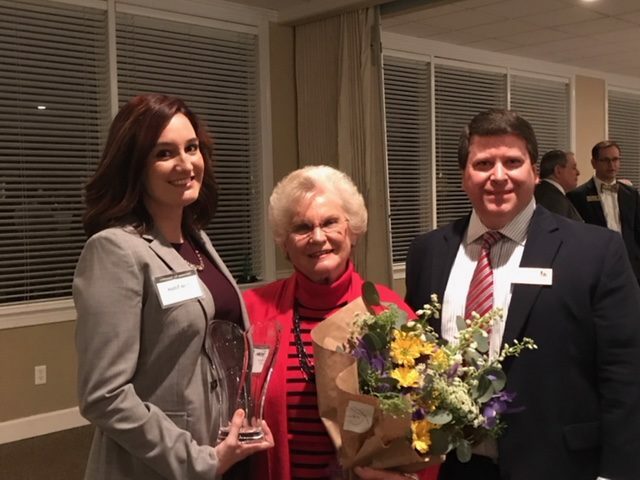 On February 6, 2018, HGS Associate Erin Tilton was awarded the Thomas M. Ervin, Jr. Distinguished Young Lawyer Award. The award is given by the Tallahassee Bar Association to a young lawyer who has demonstrated exceptional service to TBA, who exhibits high standards of professionalism, and who has participated in activities promoting interaction and collegiality among TBA members. Tom’s wife, Helen, was in attendance to present the award to Erin. Previous recipients include Melissa VanSickle (2011) and Darby Kerrigan Scott (2016).